The 360 Modena was the first road-going Ferrari constructed entirely in aluminium including the monocoque chassis, bodyshell and suspension wishbones allowing weight-saving benefits and increased performance of previous mid-engine V8 cars. 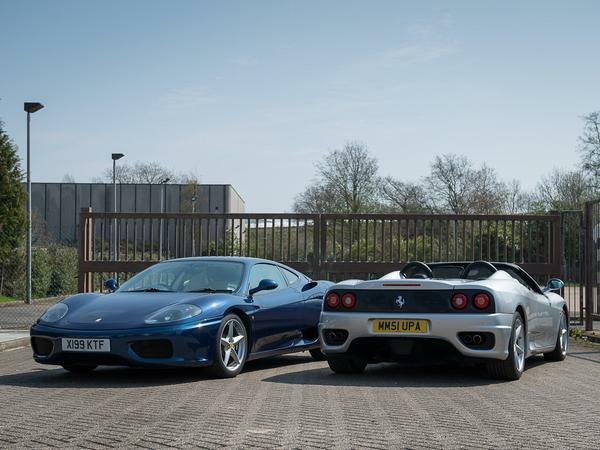 Launched at the Geneva Motor Show in 1999, the 360 Modena was a radical departure for Ferrari even down to the removal of the previously-iconic central egg crate “radiator” grille. Replacing them are twin radiator inlet grilles, one either side, allowing airflow to pass under the raised centre section to feed via the flat bottom to the twin rear diffuser section, increasing downforce as the car’s speed increases. However, some retro detail was included, for example the engine compartment intakes in the rear wings that hinted of the Dino, plus the traditional paired rear light design. This left-hand drive berlinetta example was imported into Switzerland by Ferrari Suisse S.A. in May 2000 and delivered by Garage de L’Athénée to it first of two owners in Geneva, before being imported into the United Kingdom in 2015 for its first of two UK owners. It is in its original colour combination of Grigio Titanio over Nero with its original Connolly leather intact and original and complete with silver stitching. The grigio carpets still have the original plastic cover intact and have always been covered by overmats. The car is located at our workshops in the UK and has covered 57,000km from new. The car has an original set of Ferrari 18” five-spoke alloy wheels each complete with Pirelli P Zero tyres and the optional red brake calipers that contrast nicely the grigio paintwork. This car has the upgraded and more sophisticated version of the “F1″ system introduced on the F355 model with the now common-place paddles mounted on the steering column. One of the advances of the revised system was that on sensing an input from the driver on either paddle, the throttle opening was adjusted accordingly during the change process to automatically smooth out the gear change. The car for the past 18 months has been maintained and serviced by ourselves including belts replaced in September 2017. The car has a current MOT until April 2019 and will be supplied with a new 12 month MOT upon sale.